The Staten Island Mall — the borough’s biggest and only indoor shopping mecca — will be expanding at a time when a large-scale retail competitor, Empire Outlets in St. George, is headed to town. While Mall officials won’t confirm the plan, sources who are knowledgeable about the pending project told the Advance that the expansion will be on the Richmond Avenue side of the mall in New Springville. It will include an “aesthetically pleasing” modern redesign that allows storefronts to be visible from Richmond Avenue, one source said. The plan also includes a three-story, above-ground garage, and calls for the food court to be moved to the Richmond Avenue side of the complex, the source said. Sources also said Mall officials are looking to attract upscale tenants and will likely attend the Global Retail Real Estate Convention in Las Vegas, from May 18 to 20, in hopes of fully leasing storefronts in the new center. However, General Growth Properties, which owns the mall, has yet to apply for permits from the city Department of Buildings for the project,” said Kelly Magee, a DOB spokeswoman. But this isn’t the first time the Mall has planned for expansion. A similar project was on the drawing board in 2008 before the economy plummeted. 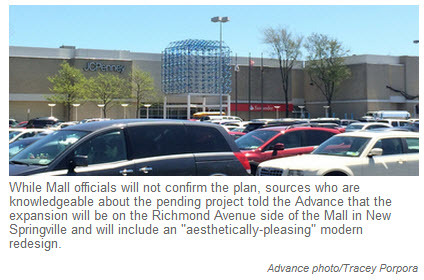 The Advance published a story about the addition of a “lifestyle center,” or open-air shopping area with pedestrian-friendly streetscapes, that was being planned for the Mall at that time. The Advance reported that the expansion involved pushing out from the Mall’s center toward Richmond Avenue to create an indoor-outdoor wing. “The Mall has had plans to renovate a couple of times over the years. I haven’t seen these new plans, but I think the Mall remains extremely vibrant; every time I go there it’s crowded,” said Linda Baran, president of the Staten Island Chamber of Commerce. Sources said the catalyst for revising the plans at this time stems from Mall officials’ desire to remain competitive amid Staten Island’s changing retail landscape. While sources couldn’t confirm whether all or any tenants have been secured, they said the Mall’s mission is to obtain high-end retailers who can compete with Empire Outlets. And it seems as interest has already started, especially among salespeople who work in different stores in the Mall. Several salespeople said they were excited about “a new wing” with upscale stores.